Shri Santosh K Misra, IAS, Managing Director, Chhattisgarh Tourism Board launched his book “Spirit of Kumbh” at India Habitat Centre in the Capital today. New Delhi, February 15, 2015: Shri Santosh K Misra, IAS, Managing Director, Chhattisgarh Tourism Board launched his book “Spirit of Kumbh” at India Habitat Centre in the Capital today. 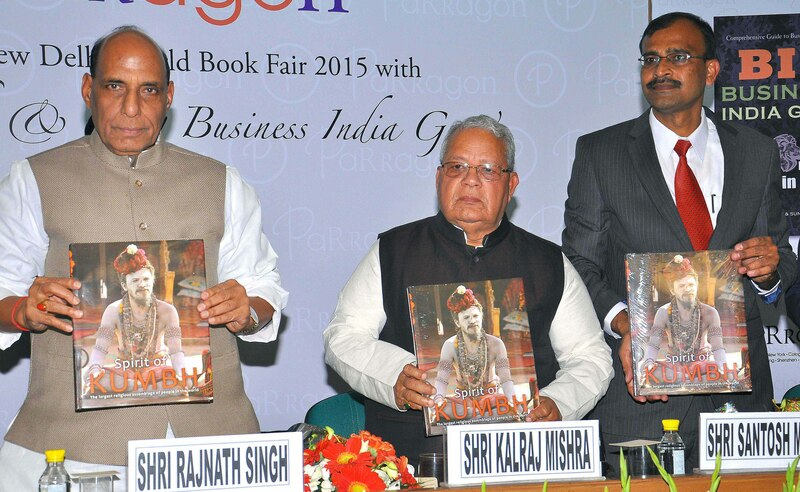 The Honorable Union Home Minister, Shri Rajnath Singh, the Honorable Union Minister for MSMEs Shri Kalraj Mishra and the Tourism Secretary, Government of India Dr. Lalit Panwar graced the occasion to launch the book authored(photographed) by Mr. Misra. Capturing the essence of the world’s largest religious gathering, the book features breath-taking photographs of two of the holiest ‘Maha Kumbh Melas’, that of Haridwar (2010) and Prayag (2013). Mr. Santosh Misra (IAS) unravels his journey across the Kumbh trail in this landmark work— showcasing a journey of the spirit, mind and the body. Compiled over a period of five years, Mr. Misra records interesting anecdotes, both with pictures and words that span across a diverse range of experiences. Every photo is wrapped in a story and every shot unravels a long eventful tale - some from the past, some from the present and some still revealing the future. From being an accomplished corporate executive in the US (with AT&T Bell Laboratories) to being a public servant, Mr. Misra has donned several hats, each of them with perfection. An avidphotographer, The ‘Spirit of Kumbh’ is his narrative of one of the oldest religious congregations in India from behind the lens. The content is essentially a rich texture of personal experiences, visual stories, views of the Kumbh Mela and how it is inherently irreplaceable to India’s identity and milieu. Invoking the importance of the Kumbh in the history of India, Home Minister Shri Rajnath Singh stated, “This is not a coffee table book, this is much more. One can't sip a cup of coffee and understand it's importance, one has to delve deep to experience the actual spirit of Kumbh. I recall the 2001 Prayag Kumbh when I was the Chief Minister of Uttar Pradesh, not a single incident/ accident was witnessed. The atmosphere was so clean; one could not spot a single fly. I know what kind of efforts go into creating a book like this. Mr. Misra has been able to spiritually connect and bring out the best of Kumbh. It is rare for a man of such position, a civil servant to take out time for a spiritual cause such as the making of this book "Spirit of Kumbh". I wish that Mr. Misra brings out more books of this genre going forward”. People from all over the world, irrespective of their race, nationality or age come to experience the Kumbh, its human extravaganza, its antiquity embedded in present day modernity, its purity of devotion”. Mr. Misra completed his BTech from IIT Kanpur and MS from the University of Minnesota, USA. Post his education he joined AT&T Bell Laboratories, USA. After a highly successful stint at the Bell Labs and a few patents under his belt, Mr. Misra returned to India and joined the prestigious Indian Administrative Service (IAS). He has a rich administrative experience and has served in various capacities in Tamil Nadu and Chhattisgarh. “I congratulate Mr. Santosh K Misra and his able team for highlighting the rich Indian traditions and culture. We will do our best to promote this book, as it carries in its pages the grand legacy and history of India. I must say that if India is incredible then we Indians are credible!” added Dr. Lalit Panwar, Tourism Secretary, Govt. of India. Witnessing the book launch in the audience were some of the most prominent public figures. Nobel laureate Dr. RK Pachauri, who is the Chairman of the Intergovernmental Panel on Climate Change (IPCC) and also heads the Energy and Resources Institute (TERI) graced the event to congratulate Mr. Misra. The Pramukh Lokayukta of Chhattisgarh, Justice Shambhu Nath Srivastava (Retired from Allahabad High Court) as well as Arvind Varma, Retired Secretary, Government of India were among the noted guests. The world’s largest religious congregation, the Kumbh Mela is held every 12 years by rotation at Haridwar, Allahabad, Nashik and Ujjain. ‘Spirit of Kumbh’ will be available on e-retailing websites, Flipkart and Amazon by the end of February. A copy of the book can also be ordered by placing a request on www.indialens.org. Disclaimer: The information provided in this Notification is solely by Chhattisgarh Tourism Board, Jagranjosh.com bears no representations or warranties of any kind, express or implied, about the completeness, accuracy, reliability, suitability or availability with respect to the information. Individuals are therefore suggested to check the authenticity of the information.